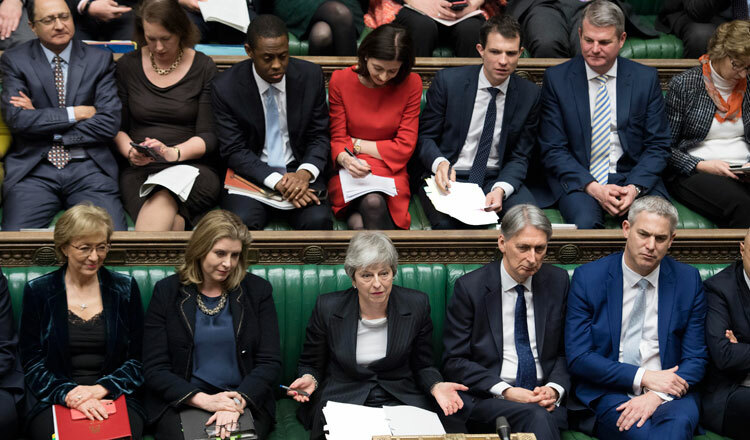 LONDON (Reuters) – The pound extended losses yesterday and derivatives markets signalled more weakness as fears grow of a catastrophic “no-deal” Brexit should lawmakers hold firm in their rejection of Prime Minister Theresa May’s divorce deal with the EU. Ms May has asked European Council President Donald Tusk to delay Brexit from March 29 until the end of June and said she was preparing for a third vote in the British parliament on the exit deal she arduously negotiated with the European Union. While banks’ probability metrics of a no-deal Brexit remain low and haven’t changed in recent days – Berenberg, for example, maintain their probability at a slim 15 percent – increased signs of unease are showing up in currency derivative markets. However, that also follows yesterday’s US Federal Reserve meeting that wiped out rate-rise expectations for the rest of 2019 and has sent global bond yields hurtling lower. The pound was broadly unchanged after the Bank of England kept interest rates steady on yesterday and said most businesses felt as ready as they could be for a no-deal Brexit. The Brexit risks as well as moves in US Treasury bonds drove British government bond yields sharply lower, with 10-year yields standing just above 1 percent at the lowest since Sept 2017.